I am building this thread in order to help all those with stock BOSE questions as far as replacement questions goes. If you know what to search for, your answers can be found quickly. But, for most this can be a tedious procedue. Below I will post some helpful hints, tips, and knowledge on how to deal with your premium BOSE system. This thread pertains to Infiniti's 96-99 with a BOSE premium sound system, if this is expandable to other years, send me a PM. THIS THREAD IS MORE GEARED FOR 96-99 INFINITI I30's, BUT YOU MAXIMA OWNER CAN BENEFIT TOO!!! WHEN I EDIT THIS THREAD I WILL PUT A PARAGRAPH AT THE BOTTOM OF PAGE STATING WHAT I EDITED. Q1. I have a stock Premium Bose Sound System in my car, what does this mean? Q2. My stock premium sound system headunit has died, what do I do. Q3. Ok so now that I have chosen an aftermarket headunit and the wiring harness of my choice, what other items do I need? Q4. How will my aftermarket radio fit into my car. I have a 1 din radio, what do i do? Q5. MY BOSE amp died on the back of one of my speakers, can i use the power from my headunit? Q6. Can i replace a BOSE speaker with a different brand speaker and connect it to the BOSE amp? Q7. Why are there so many damned colors? Q8. WHOA OMG, WTF. I have an extra black wire eminating from my METRA harness 70-7551, who what and why is it there and what do i do with it? Q9. My harness comes with crimp tubes, are these any good? Q10. How is My BOSE Headunit grounded? Q11. Ok so now that you have explained these confuzzling ground wires, how the hell do i ground my new aftermarket headunit? A1. You have a Clarion headunit(even though bose is plastered all over it) which integrates to individual BOSE amplifiers which feed power to each BOSE speaker. A1. You have choices. Get it repaired, which can be costly and far from time efficient, or purchase a headunit of your choice. There are 2integration harnesses that allow you to send a signal from your new headunit to the BOSE amps behind each speaker. This harness is all well and good, but it is taking the raw power signal from your headunits internal amp and sending it to the BOSE amplifiers. This harness is geared for aftermarket headunits without 4 sepaker preamp out jacks. This method will work, BUT, you get alot of distortion because it's a high level signal. TOO much signal produces distortion, too little signal will prevent the volume from reaching a decent level. As I said before, this will work, but you will get a crappier signal. This harness is the best harness you can get. This harness utilizes the low level RCA preamp outputs of your new headunit to produce a clear signal to your BOSE amplifiers. With this harness you bypass your headunits internal amplifier and use only the preamp outs. This method supplies the proper amount of signal to eliminate distortion presented by direct amplifer hookup like with the Metra 70-7550. This adapter will allow your stock antenna wire to work with th aftermarket antenna wire found on the rear of your aftermarket headunit. A4.You need to get a dash kit. There are several companies that sell dash kits to fit your stereo, but for the sake of keeping everything from the same company we will use METRA as our source for this dash kit. For infiniti purposes, you will not use most of the pieces floating around that center section. YAY! A5. NO, NO,NO. Bose runs their speakers at 1ohm. Aftermarket headunits run their channels at 4ohms unless otherwise stated. 99% of the time it will be 4ohms. A6. NO, NO, NO. Once again, the speaker runs on 1ohm, most, 99% of aftermarket speakers run on 4ohms. You will ruin the amp or your speaker, whichever comes first. Q7. Is it hard to intergrate the wiring harness? A7. Not at all. When you intergrate the wiring harness of your choice you are not splicing any part of the existing harness. The harness that is attached to your car remains the same. The intergration harness you purchased will plug into your car's harness. From here you have wires on the opposite end that need to be attached to the wiring harness that cames with the aftermarket headunit you chose. Both the headunit and and Metra cable come with directions specifying what color wires are for what. The Metra cable packaging has the wire designation on the back so do not throw the packaging away. Somewhere in your headunit manual will be the wire color designations for their harness. A7. So many colors because of so many connections. Most aftermarket manufacturers follow the same wire color schemes to keep things more uniform. It is easier on everyone'es part when it's this way. HOWEVER, this is not true in 100% of the cases. Always double check to make sure that the colors match so that when you hookup your accessories you dont ruin anything. A8. Ok here's the deal. After alot more research i am fixing this answer. The deal is, there are 2 ground wires, 1 per harness. Unfortunately, there will most likey be no place to connect these to on your new aftermarket headunit because these wires are grounds for the bare negative wire which travels along side your + and - signal cables to your amps at your speakers. This method is called shield wiring because this single bare negative wire removes electrical pulses from its environment and grounds them. This prevents interference on your signal. Basically, now that you know this you should ground these two wires to the chassis as close as possible to the HU. I haven't done this yet because i just figured it out so i will fix the end of this and tell you all where i put my grounds for them. A9. The crimp tubes are fine. The metra harness's don't have crimp tubes to my knowledge but many times, in the case with my alpine headunit, the headunit harness has crimp tubes. You can use these tubes and things will work fine but it is always recommended that you twist the wires together and cover it with something to protect the bare wire. I always ditch the crimps and twist the wires together and then use heatshrink tubing. You should solder the wires together as well and then cover with shrink tubing, but you dont have to. Make sure the wires are firmly together. If you chose to forego the shrinkwrap, use electrical tape. Choice is up to you, i just find shrinkwrap tubing to be more of a finished look. A10. The way your BOSE headunit grounded is via the metal case. In other words, your headunit is screwed into the cage which is screwed into the dash which is connected to the chassis which is a common ground to your battery. A11. Well, there are options. Chances are you new aftermarket headunit will come with a black ground lead on it. In the case of our cars, ground the wire to the chassis spot of your choosing. Your new aftermarket headunit may grounditself to the chassis via its metal casing but make sure that the black ground wire from your new headunit is grounded to the chassis. Additional items may be found on METRA's website. Put your car info in and you can choose your application needed. If you want to poke around for other car shiz, check out Installer.com. That is where i purchased my harness, they have everything you need to do a great intsallation. Ok, after consulting with the mechanics manual for the car with alot of trying to figure out the wiring schematic i have come to this. I have no idea what the popping noise yet, BUT I HAVE ALTERNATOR WHINE. yes quite annoying, but i have learend a couple good things. I still have a popping noise, havent figured it out yet. I have some slight alternator whine. I am assuming that this was there originally for me but was inaudible due to the original type of harness used on my radio. Now that i am using RCA's it is much clear, but the whine is now audible. I am assuming this has to do with my currently ****ed up grounding situation. So as soon as things are properly grounded we should be good i hope. As a side note, i never had alternator whine until i had my new headunit installed. So it has to be it. This is as if you were looking at the harness connected to your car dead on with you holding the connectors with the top row missing 2 connection points in the middle. These numbers are verbatim from the mechanics book for a 1996 infiniti i30 with a bose premium sound system. I take no responsibility for you messing up your car or electronics. The info above was supplied as guidelines for you to make good decisions and to help aid you in your purchases and install. If you feel that you cannot or feel that you do not possess the knowledge and ability to make the right choices, go to a professional installer. Last edited by SuBXeRo; 02-24-2008 at 09:17 PM. hey guys, im actually going to replace the bose radio in an extra car I have ('96 I30) when I get some extra time this weekend and ill post some pictures of a few steps for you all. As well i'll post the solution pictures to your grounding and ground loop(engine whine) problem. I'm also going to replace the power antenna just in case any of you are interested for the future. 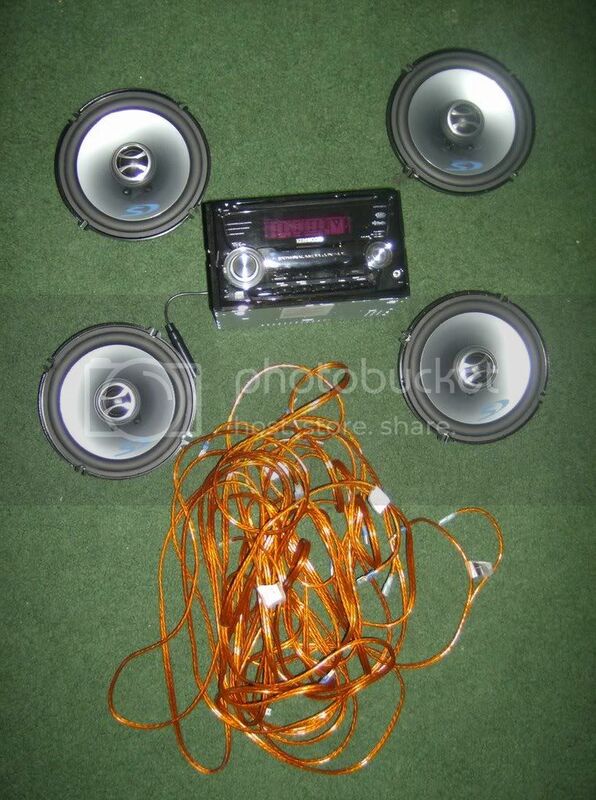 I have a 1996 Infiniti I30 with a Bose stereo system. A few days ago, the head unit just stopped working. There is no lights, sound, click, or hisses. It is almost as if there is no power come to it. I checked the obvious fuses that had anything to do with the audio but still nothing. I have removed the head unit and have it sitting on my desk. Is there a way i can hook up a 12volt battery and see if it powers on? If so, where do I connect the positive and negative. I have attached some pictures to show what the back of the stereo looks like. I have a cassette stuck in there too that I want to take out. I can't get the harness connectors out of the original head unit. Any ideas? Pull really hard? push down the tab and then pull, you may need to wiggle it a bit. You mean the two black tabs right? Thanks. no, on the connector there is a push tab that has ridges on it. you push that down then pull it out. You are awesome my friend. THANK YOU. I get that every now and then. I purchased the integration harness metra 70-7551 to install a new deck in my 1996 Infiniti I30. I do not know how to connect the RCA preamp outputs. I have connected them to the new deck and I do not get any sound. Any help would be greatly appreciated. the RCA jacks on the harness are supposed to be plugged into the RCA outputs of your replacement head unit. all the other threads i read about this topic state that you should use the PAC ROEM-NIS2 harness instead. it was a converter to convert the signal for the bose amps. Any input on that? if you lack rca outputs on your H/U then yes you can use that adapter but it will suffer a loss of sound quality. I did plug the RCA jacks into my new H/U. However the new head unit has only 1 pair of preamp outputs. The Metra 70-7551 has two pairs of RCA jacks, a pair for the front and a pair for the rear speakers. I should still get sound if I plug in a pair into my H/U even if it has only 1 preamp output. Right??? you should get sound out of the set of speakers you plugged in. I have first hand experience with this. I purchased the Metra 70-7551 harness but when I got it all hooked up I had to turn the volume up more than 50% to hear anything at all out of my new Panason HU. The volume was very low. From researching I found out that the pre amp outputs on the after market HU have to be at least 4 volts to use the 70-7551 harness. Anything less than that and you'll get the very low volume issue which is problem I had because my pre-amp outputs were only 2 volts. So now I'm currently using the PAC ROEM-NIS2 and it works great. I did have to ground the ground wires to chassis to stop some static instead of using the stock grounds. Other than that everything works great. So far, I have removed the old HU and necessary components. I'll just post pics since they'll describe my process a lot better. The existing harness(es) and antenna adapter. What I believe to be the stock amp. Correct me if I'm wrong, but that's where the current harness leads. I also have these accessories on hand: Pioneer Harness, iPod cable, Pioneer Antenna adapter. I believe the amp is built into the deck and also on the rear deck for those with subs. I see. I'm not planning on removing it, anyway. I did this on my wife's old 98 I30t and it took me about 6 hours start to finish, but the sound improvement was DEFINITELY worth it!! Last edited by Sam o nela; 10-03-2008 at 09:47 AM. Thanks for the input, Sam. I am actually planning on throwing new speakers in as soon as I have the time and money. I have a set of 280w Pioneers and a Kenwood amp from my old Pontiac. Would you recommend any certain type of speaker cable or just your basic 16/18 gauge wires. I installed everything just fine, but there is a little pop every time I switch inputs. I'm guessing that has something to do with the existing amps? Just registered on these forums to ask a simple question pertaining to my friend's 1996 Infiniti I30. This thread actually helped me locate all the parts we were going to need in order to install a Pioneer AVIC D3 into his car. My only question is, how do I go about locating the VSS wire for his I30? I've searched numerous other forums and gone through wiring diagram after wiring diagram with no luck. Any help on this subject would be much appreciated, thanks in advance. wiring harness, radio adapter and a dash kit for the finish. i don't know where i can find a dash kits for the car..
i only want one for just the for the radio...not for the whole thing!!! did you download the FSM for it? hmmmm. i just replaced my stock radio with an after market pioneer. i also installed an amp, a 10 inch kicker sub and two bullet tweeters. however i wasnt sure if i cud just connect the factory speakers to the amp without disconnecting the factory amps. so i jus ran the wires from the head unit area to the amp and didnt connect them. so what i have is jus the sub and tweeters on the aftermarket amp. it sounds okay but i just wish i cud get the factory speakers on the aftermarket amp also. do i have to first disconnect the factory amps or should i just connect em up? and i just read that i should upgrade the wires from the h/u to the factory speakers... what are yu guys' ideas? First of all I'd like to say this is an amazing post! very helpful thanks for everyones time. Just a quick question, my friend is giving me a prebuilt dual 10 inch sub box with amp. I was wondering if theres a way to wire these subs into my current sounds system. I have a 1997 I30 with the bose sound system. If so is it a veru hard job for a somewhat beginer or is it better to bring it all to a shop. If not, would replacing the entire sound systme be worth in in your opinions? Last edited by McLaren15; 03-05-2009 at 10:21 AM. So I talked to a couple shops around where I live and they said I should get a splicing unit to run power from my back speakers to the subs. Is this a viable option or is running an additional power cable a better idea if I can do that?